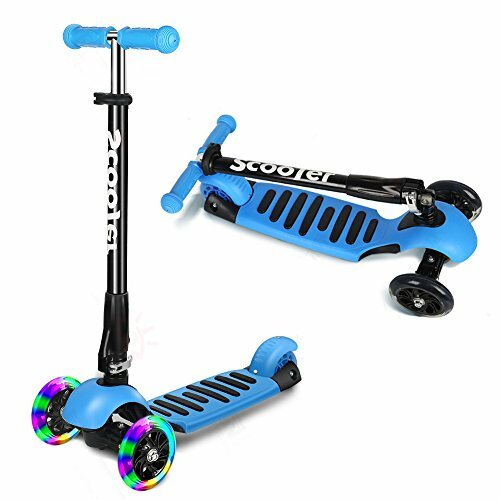 SAFETY DESIGN: 3 wheel design guarantees more stability for beginners who are not good at keeping balance.The extra wide zebra strip glass fiber pedals makes for anti-slip and safe riding.The anti-slip handlebar provides firm grip and precise control. FLASHING WHEELS: The two 120mm big front flashing wheels make for a bonus for your funny and cool riding.The wheels needs no charging for it contains magnetic steel that will be luminous as the wheel rolls. HEIGHT ADJUSTABLE: The scooter can be adjusted to 4 heights,which respectively are 24.7inch,31.4inch,33.4inch and 35.3inch.This feature allows for the growing of kids.The scooter will become a permanent companion during your kids' childhood. EASY LEAN TO STEER :The scooter will turn in the direction where you incline and apply presure. ICODE Kids Scooter come with delicate package, best gift for Baby Boys Girls . Support 12 month warranty . if you have any issue, please contact us, we're here to help. If you have any questions about this product by ICODE, contact us by completing and submitting the form below. If you are looking for a specif part number, please include it with your message.